This chapter presents empirical findings to oppose the discourses of liberation presented in postoperaist accounts of ‘immaterial labour’ and their modern proponents. It suggests that for creative labour the potential for creativity exists only in denial: capitalist development alone will not deliver fulfilled work. There must be struggle to recapture creative activity from its imbrication in capitalist social relations. Focusing on the movement of creatives from formal employment to freelancing, the chapter explores the possibilities of, and barriers to, this struggle. 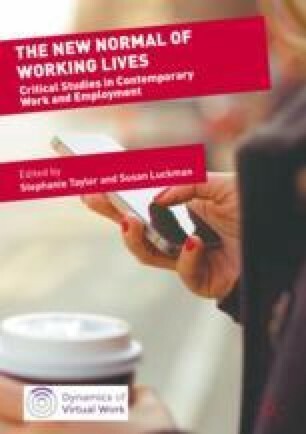 In a case study of creative labour in the UK and the Netherlands, it examines the wider economic and employment context behind the movement of creatives from formal employment to freelancing, the struggle they wage to be creative and their nascent forms of coalition-building. This chapter reports findings of research conducted under two separate grants. The first is as part of PhD research funded by the Economic and Social Research Council [grant number ES/J500015X/1], the thesis resulting from which is drawn upon at various points over the course of this chapter. The second is a three-month Short-Term Scientific Mission funded by EU COST Action IS1202: The Dynamics of Virtual Work. My thanks to the COST Action, especially Ursula Huws, for this support. The STSM took place at Erasmus University Rotterdam, and facilitated my contribution to the research consortium ‘Bonding E-Rhythms’. I would like to thank my academic host at Erasmus, Marli Huijer, for her time and support in helping me complete the research. Thanks are also due to the Bath Alumni Fund for the additional funding they provided to support my time in the Netherlands.